My mojo seems to be in hibernation mode and I'm in one of the rare moods where I actually feel like blogging. Can you believe it? I haven't finished anything crafty in a while so I don't have anything cool to show. I'm spinning some stuff but I'd rather wait until its finished so I can give the full story about the project. 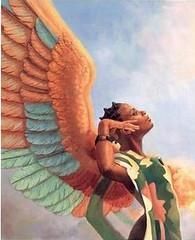 So I'm willing to put my business out there for the sake of this blogs. I started this this past summer after seeing a fellow Sit n Knitter working on a black one at a meetup. Like most projects it started out great. 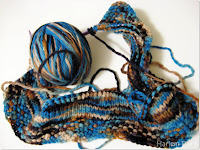 The yarn is some old Woolworth type lionbrand yarn that someone gave me from their stash. I thought the color would be great as a shrug so I casted on and worked on it exclusively for a good month. 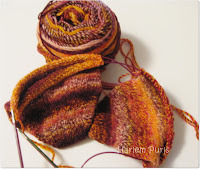 I lost steam when I came to the part where I had to increase twenty billion stitches evenly in two by two ribbing. Its been sitting in the corner ever since and I have no idea if I'll ever finish it. 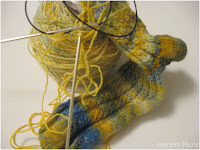 I have no idea when I started this sock, 2008 maybe. I know the fiber I spun was from Crown Mountain Farm but other than that, I know nuh-ting. 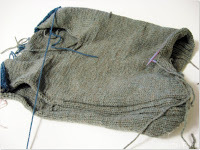 I have no idea how many stitches I casted on, what pattern I'm using or why I decided to change the pattern to a regular rib on the front leg portion while keeping with the instep pattern on the back leg. Then I switched it back. What I was thinking. I did it not only once, but twice! This yarn was also spun from Crown Mountain Farms fiber but I'm stumped as far as any other info. All I know is that I casted these socks on a while ago, saw that they were coming out way too big and thew them in a corner. I'll probably end up frogging this project and make something completely different. 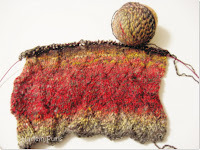 I had orginaly started a shawl with this handspun yarn made from Spunky roving. I designed the shawl pattern for this contest knitty had a couple of seasons ago. I was about halfway through the shawl when I got distracted and dropped a stitch and that's all she wrote. I got so frustrated that I ripped the whole thing that same day. I felt a little bad afterwards because its not the yarns fault I dropped a stitch. I casted on for a scarf thinking it would help me feel better but it didn't really. I'll probably end up frogging again. According to Rav I started this in March of 09. It started out great but I got stumped when it came to the edging. I can't decide if I want to do a hemmed border or a rib, and if I do choose rib then what kind, 2X2, 4X2, argh! I probably need to add a couple of inches anyway because this boy grows like a weed. I think I started this hat last winter knowing full well that I didn't have enough yarn to finish it. What was I thinking and why haven't I frogged this yet? I scored this beautiful wool yarn about 3 (maybe 4) years. 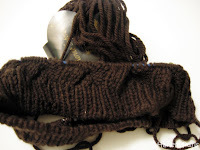 Only problem is that I was only able to get one skein of it so I didn't have many options as to what to knit with it. I decided to cast on a sideways scarf and I promptly put it down somewhere and forgot all about it for no reason in particular. I started this jumper for my fiance's godson who was born in July of last year. 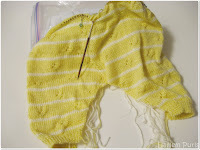 This was quite an undertaking being that I am using a pattern from a Japanese knitting book. I know what the character for stitch, row and gauge are and I can follow along most of the schematics so it wasn't too bad. I missed finishing this in time for the shower so I figured I would have plenty of time to finish it. I'm afraid it may be too small for him once I'm finished. 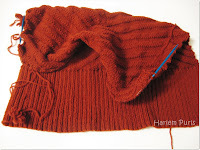 Last but not least, I started this sweater in May of 2008. 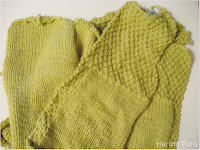 I finished knitting the pieces by July 08. Its been sitting there all this time just waiting for me to seam it. Yeah, I know, I'm lame. I should just go ahead and finish it already. So those are my dirty little secrets. Maybe I'll finish them, maybe I'll rip them, who knows. I hope you've been thoroughly entertained. Now go forth and knit!